Instagram is currently the fastest growing social network. Recently users felt a shift in the service during database maintenance. Both Instagram and its parent company Facebook did some house cleaning due to the amount of fake and spam accounts. During these updates, it has been reported that Instagram is not emphasizing posts of accounts that have a large number of followers. Not all media is treated equally. All accounts (private, personal or business) are ranked. If the account is ranked highly, the posts that account makes will be seen by more people. This also works the other way though, making it harder for poorly managed accounts. One way to see if an account has poor ranking is if they have 1K+ followers but doesn’t average more than 50 likes per post. The focus is shifting to engagement percentage: how many audience members interact per post. One of the best examples of a really good engagement percentage is @phtptxclsv. Patrick gets hundreds of likes and comments for every post he does even though he’s only got a few thousand followers. He’s got a loyal and engaged following. Now that Instagram is no longer focusing on total follower count, online marketers need to adjust their strategy. Interaction and engagement on each post is one of the best predictors for how much reach an account can get. Account managers should focus on building an engaged community online. 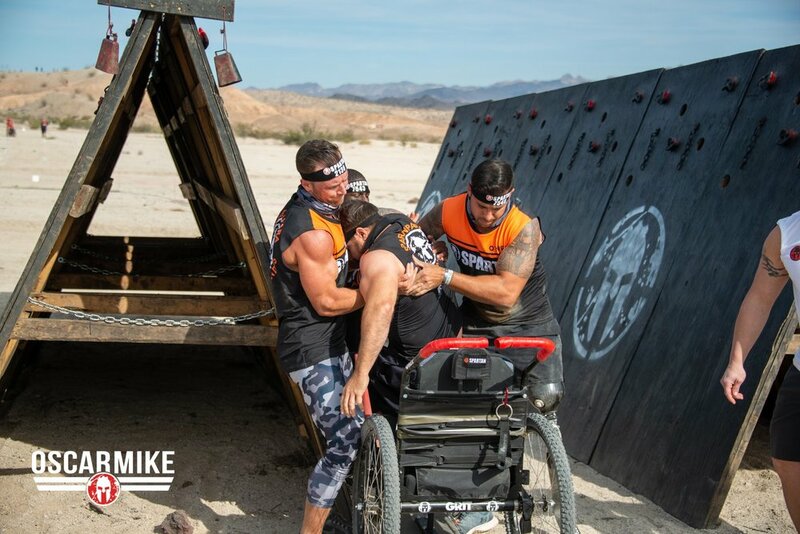 Spartan hosted the very first Para Elite Spartan Race in Laughlin, Nevada November 17th, 2018. View the official Spartan Facebook live of the event here. What is Para Elite you say? I'll tell you what it is. It's a group of people who just want to have an equal opportunity to race as athletes with the bodies we were given. It's taking what’s left of us and dragging it through sand and mud to climb the mountains that represent adversity. It's using crutches, prosthesis, chairs, or the eyes and hands of someone else to pull us over walls and through our fears. It's jumping over fire with the fear of being burned after having already survived massive burns. It's leaning on your teammates to keep you focused when all you want to do is stop. It's more than surviving, more than just getting through the day. It's showing up, putting forth your very best effort, and accomplishing things you never imagined you would. It's being a Spartan. They brought us in by the sound of bag pipes, ready to send us to battle. That battle would be against other Para Athletes but more so against ourselves. There was a grand prize of ten thousand dollars on the line and our biggest obstacles were our own bodies. We all had bodies that varied with different levels of functionality. A point system was created to keep the teams on a level playing field. Anyone with a lower limb limitation was going to have to work extra hard in the sand, and anyone with an upper body limitation would have to work on just about everything else. We sang out with a battle cry, "Aroo, Aroo, Aroo," and it began. The greatest race the Mojave Desert has ever seen. The course was an extremely sandy and rocky 4.78 mile course containing 20 obstacles. Everything from climbing walls to rolling mud and barbed wire to monkey bars and the multi-rig. This was the exact same course that able bodied athletes started running just a half hour or more before we did. 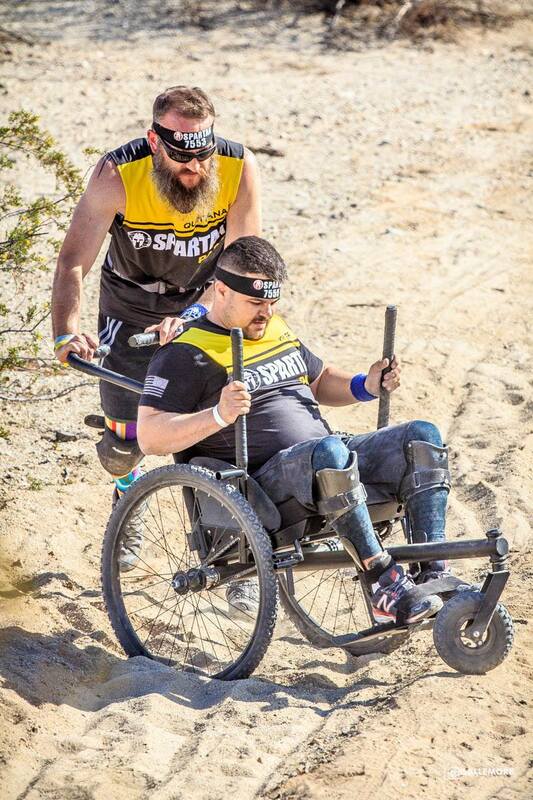 Wheelchair athletes were able to use GRIT Freedom Chairs to take on the terrain. These chairs have handles you pump back and forth to propel the chain driven chair forward. The athletes would get out and crawl at times, their legs not functional, and a teammate would push the chair for them. Other times you can see teammates carrying someone to help them keep moving. There may have been times where the athletes wondered what they were doing out there, but not one of them regretted it. For once, we were the elite. We were the ones given the chance to prove how much we deserve to be treated equally. This was my very first obstacle course race. I had very little idea of what I was getting into but I trust my teammates with my life and they are my rock. We moved as one, walking or running together. Strategizing weeks in advance and every moment possible before the race. During the race we would adjust and strategize even further. We came to win, to set the bar for future Para Athletes but also for ourselves. We were given an opportunity and to come with anything less than our everything would be an insult to those who worked so hard to make it happen. The athletes who came before this race, the pioneers so to speak, deserved nothing less than our best effort. We were grateful to be there and even more grateful to be a part of history. My team had the honor of winning first place among an amazing group of athletes. We worked as a "well oiled machine" according to one of the Spartan commentators. We listened to each other, we put our pride away, and we worked together as one. Had one of us been missing, it wouldn't have been the same. Out of the four of us, we only had 4 hands and 7 legs. That didn't stop us though because we leaned on each other. Every single athlete was there to do one thing, and that was to pave the way for other athletes. History was made that day and next year will be even bigger. 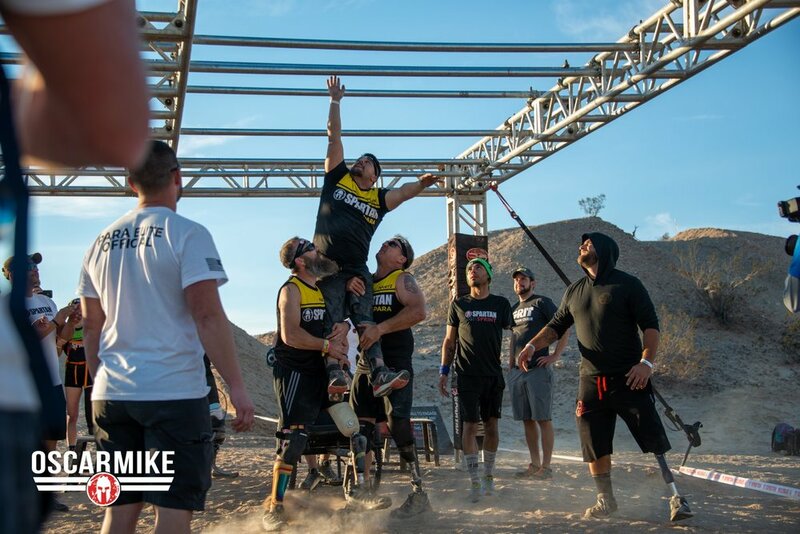 It's things like seeing the Yellow Team from the Adaptive Training Foundation, who knew they were the last on the course, climb up a hill with no sight, no chair, no stability, then come down to the monkey bars and try and try until they got across, that makes you get off the couch. They had zero excuses and zero quit. There wasn't a dry eye around because we all knew how hard it was on their bodies but more importantly how important it was to overcome those obstacles of fear. Thank you. Thank you to Spartan for giving us a chance to show you that we are Elite Athletes. Thank you to athletes before who have been the pioneers working to see this day through. Thank you to those who organized the whole event and had patience with all of the athletes needs. Thank you to all of the sponsors who helped support the event and to the organizations that sent athletes. And a big thank you to my team, because I hate burpees and you guys are beasts. *Photos were taken by Oscar Mike, Spartan, and Gallemore Photography. Welcome to the first blog post I have ever written. I’ve thought about it many times, jotting down the ideas in my head for the world to read, but nothing gave me enough passion to actually put the words down. Until now. This weekend, in the biggest Apple of the USA, I had the honor of attending an event that the world needs to know about. I call it “The best kept secret” and I’m about to be a rebel and tell you about it. There is this organization out there called No Barriers and it has the power to impact every person in the world. The organization believes that what’s within you is stronger than what’s in your way. There are seven “Life Elements” in which they utilize to live a No Barriers life. The first one is Vision: to define a purpose that inspires you to give your best back to the world. The second is Reach: to move beyond your comfort zone to grow and reach goals. The third is Pioneer: to persevere through challenges to innovate. The fourth is Rope Team: to collaborate and connect with others to build strong communities. The fifth is Alchemy: to harness experience into optimism. The sixth is Summits: find the gifts earned through the struggles. Finally comes the 7th and possibly the most important of the Life Elements which is to Elevate: impact the world as a leader who serves. An image showing the seven Life Elements of a No Barriers Life: Vision, Reach, Pioneer, Rope Team, Alchemy, Summits, and Elevate. This year’s Summit was one of eight official events. The first was in 2005 with a sort of test event in 2003 that could make this years the ninth overall. On the website, No Barriers describes the event as such: “The No Barriers Summit New York City is the place where leaders, change-makers and aspiring visionaries from all walks of life unite to discover how to bring the No Barriers Life to a world ready for greater possibilities.” However, they don’t tell you about how much the event truly has the ability to change you. I saw people cry tears of joy, I saw them break down barriers that they placed on themselves in their lifetime, but more importantly I saw them break down the barriers others have placed on them. This event offers classes and panels from experts in their respective fields that the attendees can take home and apply to their own lives. These classes are everything from rock wall climbing, adaptive boxing, yoga, and CrossFit to things like Broadway and music classes, new technology and so much more. I’ll let you in on my experiences with the classes I attended and the people behind them. Let’s start with innovation, because face it, you’re not ready to hear about me twerking and I certainly wasn’t aware I would be learning how. I chose the No Barriers Life Panel for my first class. I was able to hear from masterminds like Chef Michael Lomonaco who is a world renowned chef and the owner of Porter House in New York City. I learned from the creator of the first 3-d printed prosthetic hand and founder of E-Nable that there is an amazing community of people working to help those in third world countries. Dr. Ann Spungen of the School of Medicine in Mount Sinai taught us about the history and future of spinal cord injuries, and the pop culture specialist Mike Muse beautifully moderated the session. It began with Dr. Ann Spungen, with her esteemed example Mr. Wu seated at the edge of the stage in an exoskeleton suit. Mr. Wu is a spinal cord injury subject and graced us with a demonstration at the end of Dr. Spungen’s educational presentation. We learned of the progression of these devices and also what stands in the way of said progression, mainly funding. The research facilities at Mount Sinai have been working hard to help progress the abilities of those with spinal cord injuries. You can follow their progress and support their development at https://icahn.mssm.edu/research/spinal-cord-injury to help others break down barriers. She shared a video with us of four spinal cord injury patients, which really I prefer to call them athletes, that completed a one mile race in the exo suits. These are people that, without the assistance of the suits, do not have function of the lower portion of their bodies. She informed us that there has yet to be a plateau in the progress these athletes have from utilizing the suit. With proper training, they improve things such as strength, bowl movement, and overall well-being. Next we hear from Chef Michael Lomonaco and I’m not going to lie about how emotional the man made me. It came out of left field and smacked me right in the face. I had no idea what the man was about to hit me with. He was extremely grateful to be on the Life Panel and even jested that he wasn’t sure why they would select him for the event. He is currently the owner of Porter House New York which Esquire Magazine called one of America’s Best New Restaurants when it opened back in 2006. He’s known for being the chef and director of the once famous restaurant Windows on The World, a restaurant within the first tower of the World Trade Center. This is where he gets me, hook, line, and sinker. He begins by telling us about his upbringing as a New Yorker, how he became a chef, and his passion for food. He then describes, with heartfelt detail, the way he loved his restaurant family. He spoke about his customers only as guests in his restaurant home and his staff as family. When the holidays would arrive, they would all celebrate together, dressed in the festive garb of their own countries. The world was truly represented in this restaurant and it was represented with love. Each word he spoke painted a picture of culture, love, compassion. Then he punched me in the face and made me cry. Nobody makes me cry my own tears, well, almost nobody. He then begin to describe the happenings of September 11th, 2001. How that morning, instead of going up to his office, he stayed on the first floor to get his glasses fixed. How his optometrist held on to his frames as they felt a massive shaking of the building. The evacuation, the realization of what was happening, and the sheer feeling that is your very heart breaking when you realize that your family is up there. My heart broke for him. It broke because I knew I would never be able to truly relate. I know where I was that day. I was in the 6th grade, in Mrs. Novosad’s English class, watching on the school’s news channel. It’s not the same. I didn’t know anyone in New York at the time, I had barely been outside of Texas. There’s no way for me to fully relate. This weekend made it more real though, which I’ll add to in just a bit. Chef, I know why No Barriers selected you. You have overcome, re purposed your life in a positive way, and you continue to elevate those around you. What I learned next was that he helped create a fund, which raised 22 million dollars the first year (they have since stopped fundraising), that would provide funds for the families of the staff that perished that day. Even the new born that was born the day after, which they will send to college with the funding. They started as a family and they continue as such. Now when I selected this class, I had no idea what to expect. All I knew was that we were going to hear from some very successful women. For me, I selected this class to go past my comfort zone. I’m the girl that has always gotten along with guys easier. Maybe it’s because I grew up with brothers and I feel I can relate. Perhaps it’s because more often than not, women tend to assume I am (insert derogatory term women use towards women they don’t know or like) simply by looking at me. What I did know, was if I was going to test the limits, No Barriers Summit was the safest place for me to be out of my comfort zone. This class was moderated by the lovely Tonya Dalton, founder of Inkwell Press. She was the one I wanted to speak to from the very beginning no matter how interesting the other panelists were. Why? Because the woman has it together, and I don’t always. Ha! No really, Inkwell Press is about organizing and prioritizing. We walk/roll into the room, there are all abilities at this event, and the first thing on the table is a simple outline to fill out. “Your Ideal Day.” We closed our eyes and thought to ourselves how our perfect day would be. What would we do, or not do? Who was there, or not there? In the end, my day looked very simple, lacked social media, and was nothing like it is now. I’ve got some work to do to get to that but it’s all a process. She moderated the lovely ladies that sat in cream leather chairs. Beautiful faces, smiling. All different from one another. First was Marshawn Evans Daniels, a woman who started with humble beginnings but who would rise higher than most. She went on the be lawyer, a finalist on Miss America, and a competitor on the hit show The Apprentice. She described how she use to be a lawyer for professional athletes and how she was treated as a woman and a black woman. She gave us insight on how dedicated she was in her schooling and other aspects in life and how at times she wasn’t quite where she wanted to be. She was a people pleaser, which I can relate to. It gets you nowhere and only pushes you further from your goals. She was even set to be married and the day before, she found out he had been cheating on her. Naturally she was heartbroken. She had dropped her goals for this person and suddenly she was lost. A woman who was so accomplished was just stuck. She had to renew her thinking and stop living for others so much and live for herself. Happily, she proclaimed she has found the love of her life and that they had been married. Throughout her struggles, she kept to her beliefs and coaches others how to do what they need to succeed. The next was another one of my favorite moments on this trip. It’s one of my favorites because she was keynote speaker that was breaking barriers simply by sitting in front of a room full of people. Dorothy Beal is the creator of I Run This Body. She has utilized running as a form of healing in her life and spreads that to others. Dorothy describes once having anxiety so bad that she couldn’t even walk into her school cafeteria. As she’s speaking, you can feel her heart pounding halfway across the room. She mentions how nervous she was having to follow after Sarah and Marshawn but I feel she turned the nervous energy into a form of raw emotion that the others in the room could relate to. She has accomplished 36 marathons and I feel that number will only increase as she grows with this life. I absolutely loved being a part of a growing moment for her, another opportunity to break down her barriers and fears. She is stronger with each experience. The Cotopaxi Questival was literally a scavenger hunt set all over New York City. Its purpose? To break the barriers you place on yourself and the barriers that others place on you. There were 300 tasks to complete, each giving a varied amount of points based on the difficulty of the task. We were to create a team of random people at the event and come together to achieve these tasks. They ranged from simple tasks like Following the No Barrier social media pages to shaking the hand of the Mayor. We didn’t get to cross that last one off, so if you know them, tell them we would love to shake hands for 6 points. We came up with the name Team Xena (which started out all women and because we don’t believe in barriers we added some good looking fellows) and we set off to conquer the big city. We started by hugging a stranger for 15 seconds. What happened was beautiful. She agreed to hug, then about 5 seconds in, it started to feel awkward and long, but by 10 seconds, we began giggling like little school girls. For 15 seconds, we trusted each other enough to not only hug, but become comfortable enough to share laughter. Later, Karl joined the group and hugged Amy who he had not met yet and it was just as heartwarming as the first time. Questival Task: Make a stranger laugh, in this case a bus full of them. Next, we opened the door for a stranger while paying them a compliment. A very simple gesture that goes a very long way. After that, we just started going down the list and picking out things that interested us as a group. Some were as easy as taking a picture of a ghost, others as fulfilling as making strangers laugh. Enter the “bus of handsome gay men,” as they called themselves, on the way to a bachelor party. We started looking at the bus because we needed a form of public transit on our list, then we learned it was a private party. I wasn’t sure how I was going to make a bus full of strangers laugh but I didn’t really have anything to lose. I hopped on the bus and we giggled and laughed for no particular reason, and off they went to celebrate life with one another. We eventually checked off the public transit task with a carriage ride in Central Park and a challenging adventure in the subways. Eight bodies, and two wheelchairs crammed in a subway elevator, Rachel is the only one you can’t see. Questival Task: Squat the biggest pumpkin you can find. While we were in Central Park we jumped in a pile of leaves as the Questival called for, granted we borrowed a bag from a groundskeeper and teammate Allison informed me I was probably jumping in dog urine, but it counted. Another one was squatting the biggest pumpkin we could find! FYI, there may be worms underneath. 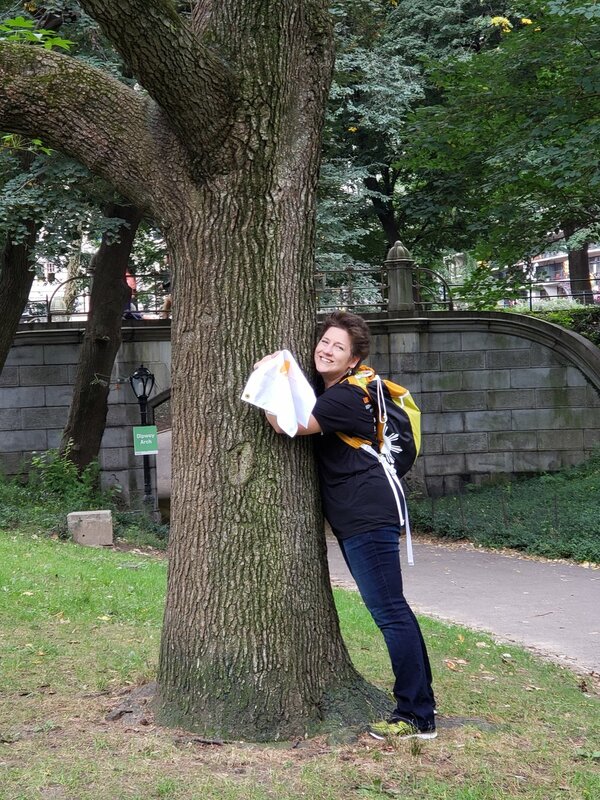 We also had to hug the state tree which we learned was the Sugar Maple. Gina took on this task. We found one, and while walking over, her entire trip turned upside down, in a good way. She came on this trip searching for something, and later learned that what she was searching for was herself. She lost a lot of loved ones at once in a short amount of time, and you could tell she had a shell to break underneath her warm smile and boisterous laugh. While walking over to the massive Sugar Maple for a hefty hug, we were just chitchatting. I told her that I had lost a lot in a short period of time too. In less than five years, I lost my brother, my mother-in-law, my leg, my marriage, my own mother and more. She broke down in tears and said she wasn’t alone, that I had lost so much too. I embraced her in a hug next to our giant tree and told her “Of course! We all have loss.” I’m kind of curious what our teammates were thinking as they were walking up to this scene, and even more so the passersby that witnessed two women sob before hugging a tree. Let’s be honest, it’s New York, no one noticed. Ha. But seriously, it was something that she needed, and it started by an adventure with like minded people. Other tasks were picking up 50 cigarette butts in a park then making a Smokey The Bear PSA which my friend Rachel nailed. Fifty cigarette butts picked up for a park and thrown away. The sight where The Twin Towers once stood. We ventured to Brooklyn via subway and found our way to Ground Zero. You can feel the energy, the heartbreak that everyone else standing there feels, the loss. People stood there and remembered. I remembered. I thought back to the words I heard from Chef Michael Lomonaco the day before and applied that emotion to attempt to understand what it must have been like. I also spoke with an Uber driver that shared his experience. I asked him how long he had been in New York, and he said “I’m a New Yorker”, that he had been there for 26 years and wouldn’t want to be anywhere else. I asked him what his favorite thing about the city was to which he replied that there were many. I told him he had to pick one, the one thing that if it were gone, a part of his heart would go with it. Without hesitation he told me that it was already gone. That September 11th was the last time he got to see it. Every day he drove by the Twin Towers and after that, he had something missing in his life. He recalled the stampeding of people and that for 105 streets he had to drive at a crawl because only one bridge was open. Again with the tears, choking them back. It was beautiful to speak with a complete stranger and feel so connected for that moment. The whole Questival Experience was like this. Life changing. Packed like sardines in the subway car. We encountered quite a few barriers on this trip. 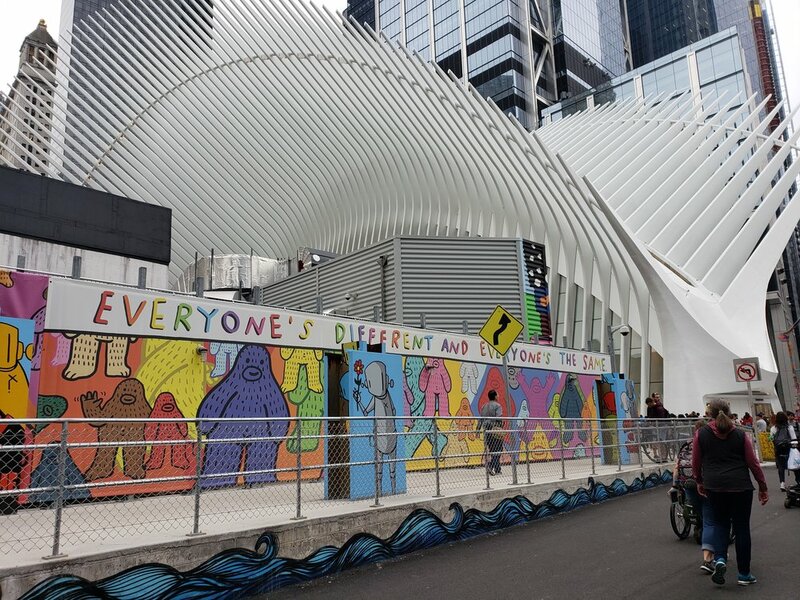 Some of them due to New York City not being the most ADA compliant, while others were social barriers or mental barriers. When it came to the Questival, traveling with two wheelchairs and over half marathon of walking was difficult. The Subway had one train that was accessible so we had to wait for a specific one. When it arrived, the first time, it was packed like sardines and there was no way we could possibly fit the two chairs and eight bodies in there. Once another train came, it was also packed. Somehow we eventually managed to squeeze in two separate cars. Subways have a weird culture to me. Nobody wants to be there and looking at a stranger is like taboo. Speaking to one is like the end of the world. Yet somehow, knowing these unspoken rules, everyone felt it was acceptable to stare at us for making them uncomfortable and taking up space. I had a girl stare me down for three stops. Eventually I just smiled and offered her a seat which she hesitantly took. Questival Task: Give someone a piggyback ride. Karl gives Alison a piggyback ride in a new way. Then, walking the crosswalks was another issue. Particularly near a roundabout by Central Park. The crosswalk didn’t line up on the opposite side of the street. We had to walk more in traffic then have a cab driver move off the ramp. We weren’t there to be Negative Nancy’s though. We just proceeded with caution and kindly asked for people to accommodate to what was rightfully in place. Everyone has something going on in life, so let’s be kind. When it came to social barriers, I had a particularly difficult time with the task of having a stranger race me. I asked one kid and he said he only races for money, another said he was too tired. I joked that they were afraid to get beat by a girl with one leg. They either just noticed it, or confirmed my claim. Eventually we went to Central Park to find runners, where we still got turned down a few times until finally we had a taker. I personally had to break some mental barriers after getting turned down so many times, and I was glad we persisted. It was worth every second of it. Ice T speaking at the No Barriers Concert with an ASL interpreter in the background. Robbie Wilde, a deaf DJ, performing at the No Barriers Concert in Central Park. This event was simply amazing. Whether it was a journey to find oneself or the amazing entertainment at the concert the last night, it changes you. It doesn’t just tell you how to break down barriers, anyone can give you that advice, but it shows you how. It teaches you how to actually apply the No Barriers lifestyle. That it’s okay to try new things and for goodness sake to actually engage with people. There are still going to be barriers in life, but you have people that have been through life as well that you can lean on. Nobody said you have to do it alone. Reach out and engage with people, you never know what they’ve been through if you don’t ask. They just might be able to give you the insight you have been needing in your own life. Thank you to Erik Weihenmeyer and No Barriers for selecting me as a 2018 Reach scholarship recipient. Without the scholarship, I would not have been able to attend. Thank you to Trey Currid, who is my boss but more like the brother I never got to argue with growing up. You make me do things, like blog… which you might regret now. Thank you to my teammates for allowing me to do all sorts of shenanigans in New York City, it’s so much better when you’re not weird by yourself. And finally, thank you to all the internet trolls out there, because without you shooting my first blog attempt down three years ago, I wouldn’t be here to say I really don’t care anymore. NO BARRIERS! Valvact came to Creative Cycle about taking their industrial valve actuation products to the Amazon and eBay marketplaces. The request was to build both Amazon and eBay accounts, then link them to the already existing website. After some quick review of other similar products for industrial supply, it seems there are quite a large number of industrial suppliers for all sorts of specific uses on both Amazon and eBay. As well, looking at sale charts for eBay, some of the more specialized products sold quite good numbers. The biggest lesson learned during this project was the strict listing guidelines for Amazon products. Since valve actuation products aren’t listed, and the manufacturers aren’t within the Amazon database, there was a lot of running around to make this happen. Both stores for eBay and Amazon were setup. Valvact had a third party develop a Wordpress website several years ago. The team at Creative Cycle was able to place Amazon and eBay logos into the sidebar menu for easy access on any page of the Valvact.com website. It will be interesting to watch Valvact grow their sales through e-commerce. As Amazon and eBay become more and more recognized for industrial supply, so Valvact should be poised to take advantage of the changing marketplace. The Creative Cycle team just finished another website for the ShAC swimming facility in Stafford, Tx. Swim Houston Aquatic Center (ShAC) is a state of the art swimming facility and event venue built in 2017. ShAC is a family owned business with a history of swimming for every member. The team with Creative Cycle wanted to make sure an tell the story of the family and provide all of the technical details of what the facility offers. The team at Creative Cycle dove right into this project and worked closely with the client to develop the layout and strategy for the website. ShAC wanted calendar and Facebook integration to provide regular updates to their customers on activities and events. As well, the website needed to be geared towards their online booking portals by Jack Rabbit. The owners of ShAC had some video and still media already (underwater and drone footage), but needed more scenes from around the facility. The team at Creative Cycle shot headshots of the ShAC team and the different areas of the facility. When accumulating all the media together the process of utilizing it for the website began. Creative Cycle gave the website an up-to-date stylistic look with modern fonts and elements like video banners. All in all the project was a huge success for both ShAC and Creative Cycle. Not only does ShAC get a stylistic and functional website, but Creative Cycle has another piece to add to the portfolio. Business like this is good for everyone - win, win. An recent study was published regarding Facebook and individuals respective dependency on the social media platform. With a fairly small sample size and a wide age range, the study may not be conclusive, but it does give some insights into how social media can depended upon. Yes, the study did conclude that the people who signed in more frequently were more dependent -- which makes sense. However, the study makes a point in that dependency is different than addiction. Social media platforms are in a large part a way to get things done; setting up (in real life) social events, make new connections, teach, learn, share, resource, help and many more things. All too often social media gets a bad wrap for the vile aspects of humanity. But what is overlooked is the amount of good social media brings to the world. As with any technology, social media can be used to create good just as easily as bad. Think of all the running, crossfit, cycling, etc groups that have created a community around being active and promoting good health. The nonprofit organizations have been able to keep their members and donors closer and more up to date with their progress. Small businesses are able to market directly to their customers in a way that wasn't possible before. Moreover, these types of interactions are quantifiable in a way that has never been seen by other media sources. Humans need to communicate. Isolation can quickly cause long term or even permanent damage. Social media just happens to be the newest way interaction takes place and it happens on a very large scale. The outcome of the study about dependence shouldn't be taken as a negative. If anything, the study proves what has long been understood in the communications world; people need people. Now, go on, get out there! Do a social bike ride and dinner -- maybe at the same time.